If I haven’t mentioned it, I love Autumn. Especially Halloween. So to get ready for the day, I’ve been crafting. Halloween is such a great time of the year; everyone’s starting to get giddy as it’s getting close to Christmas, there’s fruit covered with toffee. And the colours are happy and fun! And honestly I think it’s the best holiday! I dream of celebrating it in California, and doing the whole Pumpkin patch and things! Hey, they go all out! To start with I made a wreath. It isn’t the norm for Halloween, but hey. 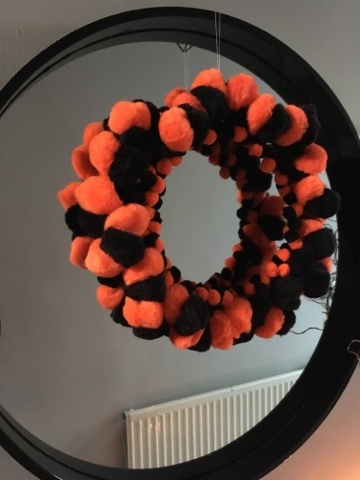 With the help of pompoms, and simply winding them round a wire frame, it creates a great wreath to hang in front of my circular mirror in the hall. The mixture of size gives great depth. It honestly didn’t take long at all, but if you try this at home be careful when using the needle to thread the pompoms together. 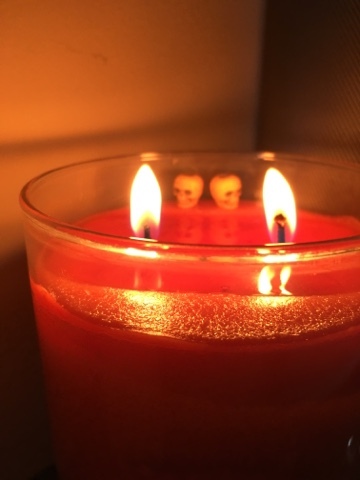 Next up, a huge part of Halloween is Trick or Treating, so I knew I needed to incorporate something edible. 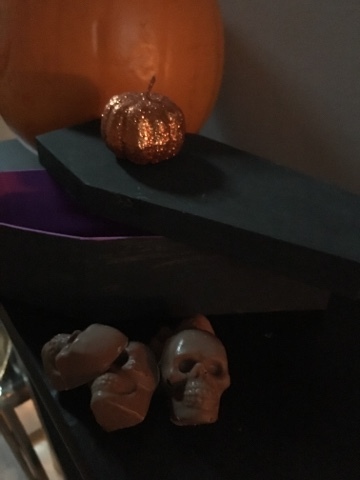 I purchased some Chocolate skull moulds from Hobbycraft (not sponsored) and carefully melted some chocolate using the banmarie method, and made these cute skull chocolates. 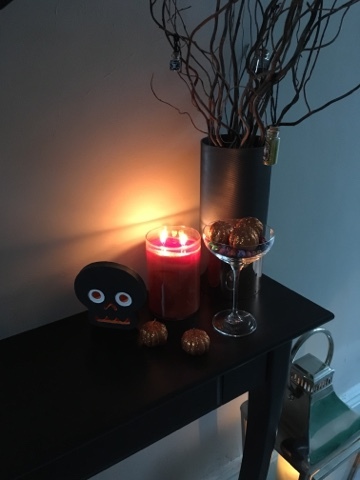 The chocolate sitting rather happily next to a small decorative coffin I painted black and purple with a glittered pumpkin on top. 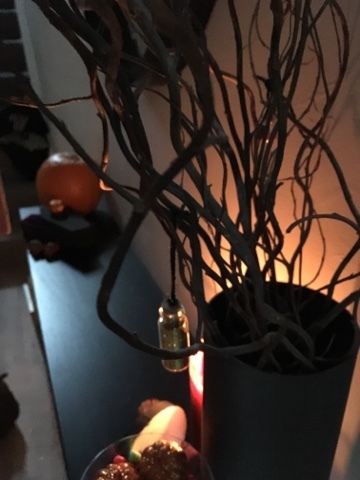 I also purchased a pumpkin to go along side. 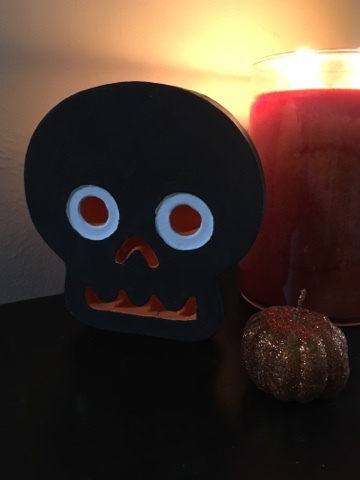 Another small paper mache item I painted was this little skull head. I feel its a little bit cheeky but it’s totally the perfect fit for my table. 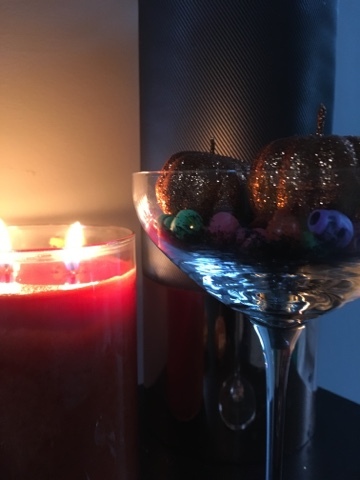 I had purchased some skull beads and had an idea to mix them with glitter, to do a sort of Halloween Cocktail (Not Edible) so I combined the glitter and the beads and added the glitter pumpkins on top. The last thing to do was obviously my beloved wedding willow. 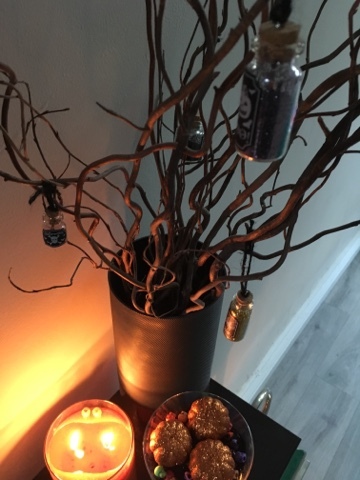 I purchased some potion bottles, added glitter and hung them from the branches.